New Zealand’s Heart Foundation has called for volunteers to join its fundraising drive throughout the country next month. Called, the ‘Big Heart Appeal,’ the drive will involve street collections on February 22 (Friday) and February 23, 2019 (Saturday). Fundraising Manager Gail McIntyre said that with one in five Kiwis dying from heart disease, the Heart Foundation needs more people to join by volunteering as street collectors for its Big Heart Appeal. “Every year, more than 6500 New Zealanders die of heart disease. While the time commitment involved as a volunteer for a few hours on one day is small, the reward is huge and will play a vital role in the fight against New Zealand’s single biggest killer, heart disease,” she said. Ms McIntyre said that funds raised during the annual appeal are used to support heart-related research and specialist training for cardiologists. “The Heart Foundation is New Zealand’s leading independent funder of heart research. Since 1968, it has provided more than $70 million for research and specialist training for cardiologists. Additionally, we perform a wide range of activities to help support people living with heart disease, and their families, and provide educational programmes and campaigns that promote heart-healthy living,” she said. 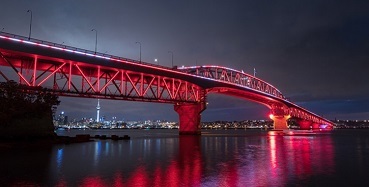 Vector Lights will illuminate the Harbour Bridge in Auckland on February 21 (Thursday) and February 22, 2019 (Friday) in recognition more than 186,000 people living with heart disease in New Zealand. Ms McIntyre said that the Bridge will help shine a light (from about 830 pm) on the importance of the Heart Foundation’s Big Heart Appeal Street Collection. Foundation Medical Director Gerry Devlin said that getting people to contribute to the fight against heart disease is an important part of its Big Heart Appeal. “Heart disease is New Zealand’s single biggest killer, claiming one life every 90 minutes. We are very grateful to Vector Lights for helping us to shine a light on this serious issue,” he said. Part of a ten-year smart energy partnership between Vector and Auckland Council, Vector Lights is an experience and a destination, giving Aucklanders a focal point for celebrating and recognising important events like the Big Heart Appeal. Vector Chief Executive Officer Simon Mackenzie said that his Company is pleased to support a worthy cause that impacts so many people in Auckland and throughout New Zealand. “Vector Lights on Auckland Harbour Bridge is one of the city’s biggest landmarks, which naturally makes it a great signifier for Aucklanders to celebrate good causes, stop and consider social and health issues that can affect us all,” he said. Information about Vector Lights, including show times, best viewing points around the City and other details are available on the Vector website.